Players in the global ready-to-use therapeutic food and supplementary food market are expected to create new scope and opportunities in order to continue dominating. Key players in the market are constantly pumping in hefty amount of money behind research and development in order to enhance their product and expand their product portfolio. Players in the market are trying to stretch footprints by improving products. This is likely to make them retain and improve their market position. Few key players in the market are Tabatchnik FineFoods, Diva Nutritional Products, GC Rieber Compact AS, Kaira District Cooperative, Nuflower Foods and Nutrition Pvt., GC Mana Nutritive Aid Products. The global ready-to-use therapeutic food and supplementary food market is predicted to rise at robust CAGR rate of 8.6% during the forecast period 2017 – 2025. The market which was valued at US$ 429.9 mn by the end of 2017, is likely to be valued at US$829.3 mn by 2025. On the basis of product, the ready-to-use therapeutic food (RUTF) is segregated into solid, paste, and drinkable. On the basis of ready-to-eat-supplementary food (RUSF) is divided into solid and paste. When combined, RUTF segment assuaged demand for over 70% in 2017. This segment is likely to dominate by the end of the tenure period. On the basis of geography, Europe alone held a demand for 54.3% in the world. 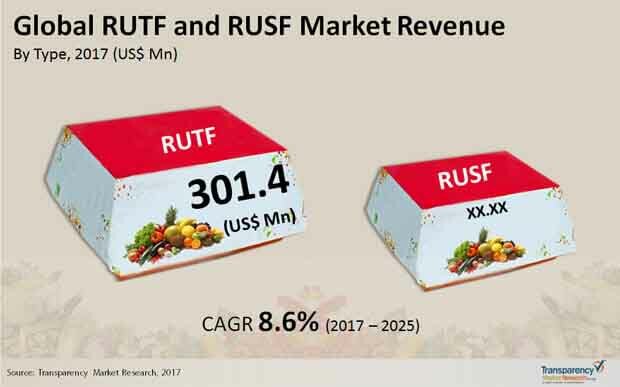 One of the major reason that is driving the RUTF and RUSF market is increasing cases of malnutrition children and adults all across the world. Extreme poverty and intake of cheap quality of food products are likely to favor the growth of the market. Various government initiatives undertaken to deal with constant growing malnutrition cases around the world will help particularly the market in the developing region grow. Increasing number of schemes by government to help to feed people below poverty line is boosting the market to grow. It has been noted that developing countries are biggest victims when it comes to malnutrition cases. Government in these countries are trying to increase awareness regarding the adverse effect one can have due to malnutrition. Another factor that is acting as a pillar in supporting the growth of the global market is the rise in number of NGOs in all corners of the world. NGOs across the world are continuously trying to slacken the rate of malnutrition by providing the RUSF and RUTF to the one in need. This is expected to increase the demand. However, it has been duly noted that rising demand for local ingredients by consumer and government coupled with rising contamination rates is prognosticated to hinder market growth.